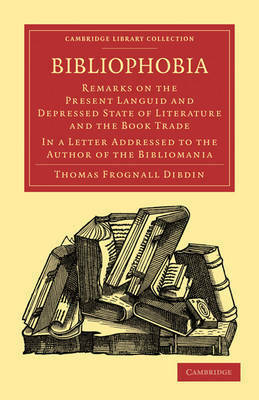 In 1809, Thomas Frognall Dibdin (1776-1847) published the first edition of Bibliomania, focussing on the contemporary craze for book collecting. 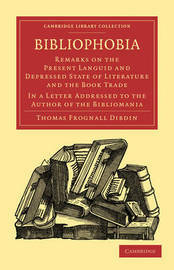 Introduced in English at the end of the eighteenth century, the term 'bibliomania' - or 'book-madness' - gained popularity with the publication of Dibdin's book, in which bibliophiles conduct dialogues on the nature and history of book collecting, and the symptoms of and possible remedies for this 'fatal disease'. Published in 1832 under the pseudonym Mercurius Rusticus, Bibliophobia is a short pamphlet, which presents itself as a letter to the author of Bibliomania. The narrator, a book-lover himself, goes on a 'bibliopolistic pilgrimage', only to find out that 'bibliomania is no more', and that 'books are only the shadow of what they were'. From book-lovers to collectors, and from booksellers to libraries, the narrator carries out his entertaining yet melancholic investigation all the way to the Bodleian Library.